Land of Israel activists Matar and Katzover were arrested after being assaulted by Arab squatters on state-owned land whom they confronted. Women in Green head Nadia Matar was detained Wednesday by Civil Administration oficials after a violent confrontation initiated by Arabs near Netzer. 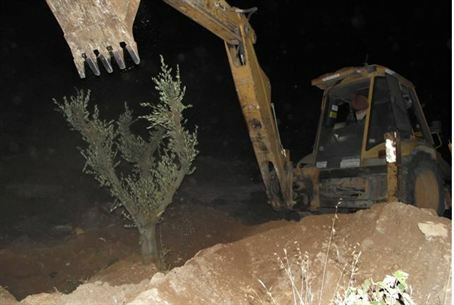 Matar's saga began Tuesday night when Women in Green planted several large olive trees on state-owned land near Netzer on a hill connecting the Jewish communities of Elazer and Alon Shvut to stop Arab encroachment. "Arabs had started planting vines there, squatting on state owned land. Then they started fencing it in and we knew we had to step in. We ordered a huge truck and came in the night. We planted many large olive trees and hooked up irrigation pipes for them. Then we posted a guard because, when we've done this in the past, the Arabs try to uproot the trees," Matar told Israel National News. Wednesday morning Matar said she received a phone call from the sentry telling her local Arab farmers with saws were cutting the trees down. Matar, her partner Yehudit Katzover, and their supporters rushed to the scene where they were violently confronted by the Arabs. "When we came we saw the Arabs cutting the trees with saws. They had already uprooted the irrigation pipes. They threatened us, pushed and attacked us," Matar related. "We started putting the irrigation pipes back together and they started striking us. Of course we immediately called for the army to come." Shortly after the initial confrontation Civil Admininistration officials, along with police and army officers, arrived to investigate the incident and took Nadia and Yehudit into custody for questioning after the Arabs accused them of being the aggressors. "This is a time-honored tradition among the Arabs: to attack you and then claim to be the vicitms. As soon as we called the Army one of the Arab women there told her son to lie down and showed him how to pretend he was hurt. The performance he put on would have won him an award in any theater. He played the perfect victim. So the police arrested us, Yehudit and I, as well as the Arabs," Matar said. Matar and Katzover were held and interrogated by police until four in the afternoon before being released. The two thanked lawyer Adi Keidar of Honenu for his efforts on their behalf. "The police held me for a very long time. They were very angry. They yelled at me and demanded we name the other Jews who were present. I refused. I told them I was there to complain about the Arabs planting on state-owned land and attacking us and would talk about nothing else," Matar related. "I told them the other Jews did not want to be involved because they know that whenerver a Jew files a complaint against an Arab they become the accused. When my interrogator heard that, he threatened me with obstruction charges. I told him he was proving my point. Finally, when Yehudit was released, she was able to get me out," Matar related. Matar, who cited the incident as a victory, said she and the Arabs were issued a restraining order forbidding them from going to the Netzer site for fifteen days while the Army investigated who owned the land. "If you call and complain Arabs are stealing state-owned land, nothing happens. They will only intervene if their is a confrontation. So, by doing this, we forced the army to come. Now they will review the maps and be forced to make a decision on the land's status," Matar explained. "We always research first," Matar said. "We always have maps and survey the areas we patrol. We know what the army will find. They say no one will be allowed in until a decision is made, but we will continue our patrols. Sometimes confrontation is the only way to force the authorties to stand up for Jewish rights." Matar was charged with obstruction and tresspassing before being released on bail. Israel Police spokesperson Mickey Rosenthal said Matar was obligated to cooperate with investigators. "As the spokesperson I can't comment on the exact tone or what have you of Ms. Matar's interview - we expect officers to be cool and collected as there is normally no need for elevated emotions in an interview - but she is obligated to cooperate and provide investigators with any information relevant to their investigation. Its her duty," Rosenthal said. The IDF had not responded to queries for information by the time this article was published.